Rescue Facts - Keep This Info Close! Rescue Facts - Keeps This Info Close! LAPregnancy wants its readers to be prepared and found Rescue Facts as an easy way to put all your children's information in one place where it's most needed: the car! There are two parts to the Rescue Facts. The first is the nylon, embroidered strap. This is made from durable nylon, similar to outdoor flag and banner material. 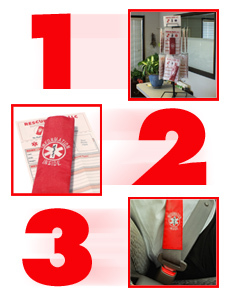 The medical symbol is on the strap and wraps around the item and is secured by Velcro. This allows it to slide freely and avoid damaging the seat belt material. Inside the strap is a pocket designed to hold the paper medical information insert card which you want to fill out! Once you have filled the information card out, you should immediately attach it to the seat belt of your infant car seat!! There's also a "Parental Consent" form and it's very important. If you are ever involved in a severe traffic crash and unconscious, or worse, it is vital that rescuers have a "consent to treat" form signed for your child or children. Additionally, emergency contact information can be used to locate family members!